A school has been forced to close its doors to more than 1,000 pupils today after a fleet of 12 caravans pitched up on its playing fields. A group of around 30 travellers turned up at Bottisham Village College in Cambridgeshire on Thursday night. The principal of the school for children aged 11 to 16 said he made the decision to close after taking advice from local police. 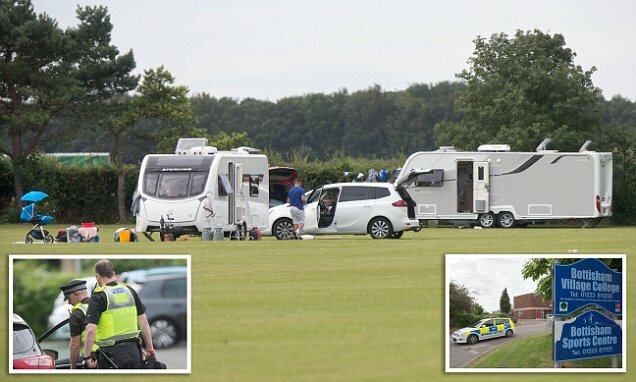 The travellers were seen chatting, hanging up washing and even playing football on the fields. A statement posted by the 1,080-pupil school on its Facebook page reads: 'Due to unforeseen circumstances beyond our control, we regret to inform you that Bottisham Village College will be closed on Friday 15th July and there will be no trips or other activities taking place. 'A large group from the travelling community moved onto parts of the college grounds. 'For those parents expecting children back from residential trips, we will be in communication with you by 10am to tell you about details concerning collection. FFs. This kind of music do you want to go for a walk? It is surely OUTRAGEOUS that any group of people can be allowed to get stuck in and clear the lot;Their human rights, and up yours, Just go in with trucks, and tow the lot out, and if the police should be doing their job and moving them off private property or arrest them. Will they be fined for causing pupils to miss school. Surely the playing fields are owned by the road so that the Police can't move them to? Come on Teresa sort these useless police out , tell them to remain in post. The arrogance of these skirts? Why should the children's education suffer because these people is beyond measure! Kick them off to a slip road on the Common.